Eight different Alexandria Times staff members or freelancers won a total of 21 Virginia Press Association awards for work published in 2018, the most in the paper’s history. The Times garnered six first place, seven second place and eight third place awards. 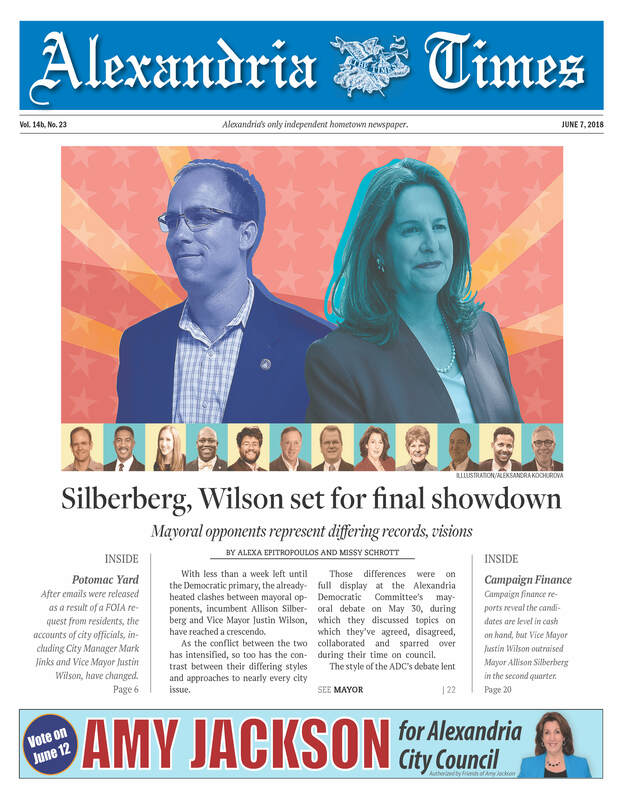 Our June 7 issue, dedicated to the Alexandria democratic mayoral and city council primary, won first place in Overall Content and Design of a Special Section category. It was also submitted in packages for Front Pages and General Makeup categories, both of which won third places. Staff members who contributed to this issue are Denise Dunbar, Missy Schrott, Aleksandra Kochurova, Alexa Epitropoulos and Margaret Stevens. As part of a package for General Makeup, our March 22 edition won third place. The story of "A school cook's forgotten civil rights stand" was also part of the first place In-depth or Investigative reporting package by freelancer Jim McElhatton. Staff members who contributed to this issue are Denise Dunbar, Missy Schrott, Aleksandra Kochurova, Alexa Epitropoulos, Jim McElhatton and Margaret Stevens. As part of a package for General Makeup, our Oct. 11 edition won third place. The story "The history beneath T.C. Williams" by Missy Schrott also won second place for the Individual Feature Story category. Staff members who contributed to this issue are Denise Dunbar, Missy Schrott, Aleksandra Kochurova, Alexa Epitropoulos and Margaret Stevens. Missy Schrott won third place in the Personality or Portrait Photo category for her photograph of James Ross, the Alexandria Symphony Orchestra Director. Times Art Director Aleksandra Kochurova led the way with eight individual awards for ad design. She won first place in the small space ads category and the fashion and personal care categories for her Eco City of Alexandria ad and TSALT fashion campaign, respectively. The Times team won first place for overall content and design of the June 7 issue dedicated to the Alexandria democratic mayoral and city council primary. Staff members who contributed to this issue were Kochurova, Missy Schrott, Alexa Epitropoulos, Denise Dunbar and Margaret Stevens. The same group won third place for general makeup of the paper. Kochurova also won third place for front page design. On the news side, Times Managing Editor Missy Schrott won three awards, including first place for her feature writing portfolio, second place for the individual feature story “The history beneath T.C. Williams” in the Oct. 11 issue and third place in the personality or portrait photo category for her photograph of Alexandria Symphony Orchestra Director James Ross, in the Sept. 13 issue. The feature stories were, “From the pub to the stage,” April 26; “Where everybody knows your name,” July 19 and “From Alexandria to Nashville and back,” Nov. 22. Times editor and publisher Denise Dunbar also won three individual awards: first place for column writing, second place for editorial writing and third place for her “Love stories of Alexandria” series in the Times’ wedding section. The columns were, “Did Graham make the right decision in ‘The Post?’” March 1; “A plastic conviction,” Aug. 2 and “An imaginary conversation about T.C. lights,” Oct. 11. The editorials were, “Should Alexandria’s high school bear the name T.C. Williams?” March 22; “Metro is an ongoing train wreck,” July 19 and “Preventative maintenance applies to ethics,” Dec. 20. The love stories were, “True love waits,” Feb. 15; “Lucky us: Say Yes to the Dress: Atlanta star, retired F.B.I agent married almost 20 years after meeting,” March 15 and “Thirty years, five children and a stand-in blind date,” April 19. Freelance writer Jim McElhatton won first place in the in-depth or investigative reporting category for his “Civil rights in Alexandria stories,” two of which were published in 2018: “A school cook’s forgotten civil rights stand” on March 22, and “The homeless man who made Alexandria civil rights history” on May 3. Times Reporter Cody Mello-Klein won third place for his feature story “Leading the procession,” which ran on Dec. 20. Former Times Editor Alexa Epitropoulos won second place for her feature series on Alexandria homes (“Selling ‘This old house,’” April 19; “Charm and color on East Luray,” Aug. 30 and “Embracing creativity on East Duncan,” Oct. 25), while Freelance Photographer Louise Krafft won third place in the picture story or essay category for her photos of the Alexandria Scottish Walk Parade in the Dec. 6 issue. Kochurova also won four second-place awards for ad design: in the lifestyles category for her Del Ray Business Association Well Ray ad; in the real estate category for her Donnie Wintermute Union Street Scottish Walk ad; in the entertainment category for her Old Town Shop anchor ad and in the education, churches and organizations category for her Yard Sale Emmanuel on High ad. She captured two additional third place awards for ad design, in the real estate category for her Hermitage ad and the professional or technology services category for her Belle View Election ad.